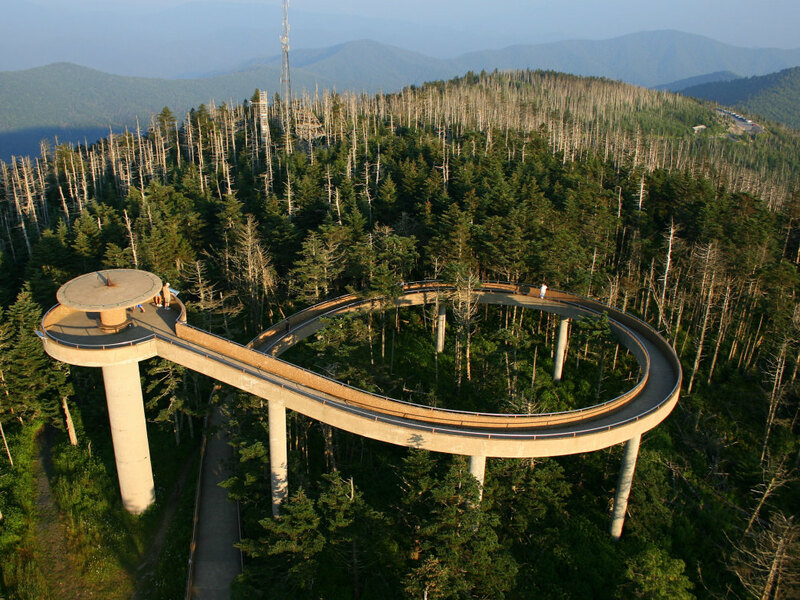 As one of the most visited points along the Appalachian Trail, Clingmans Dome is in the center of the Great Smoky Mountains National Park and gives you a 360-degree view of the Smokies from its circular lookout tower. It’s a popular stopping point for park visitors during the peak seasons of spring and fall, and is accessible by car from US-441 to Clingmans Dome Road—a seven-mile drive that leads to the Forney Ridge Parking area and trailhead, just 300 feet below the summit. Though the incline to the tower is paved, it’s still quite steep. 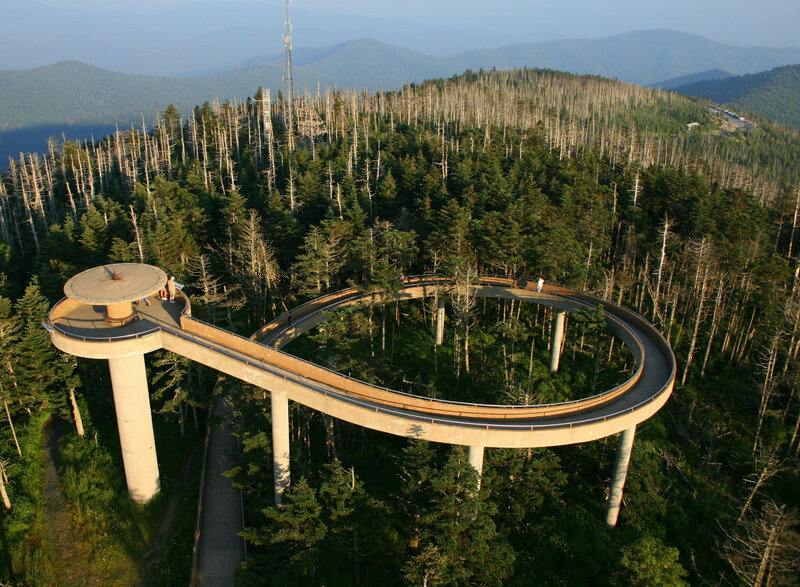 Note: Clingmans Dome Road is only open from April 1 to November 30. Also, be sure to check your route before starting to make sure there aren’t any trail closures. 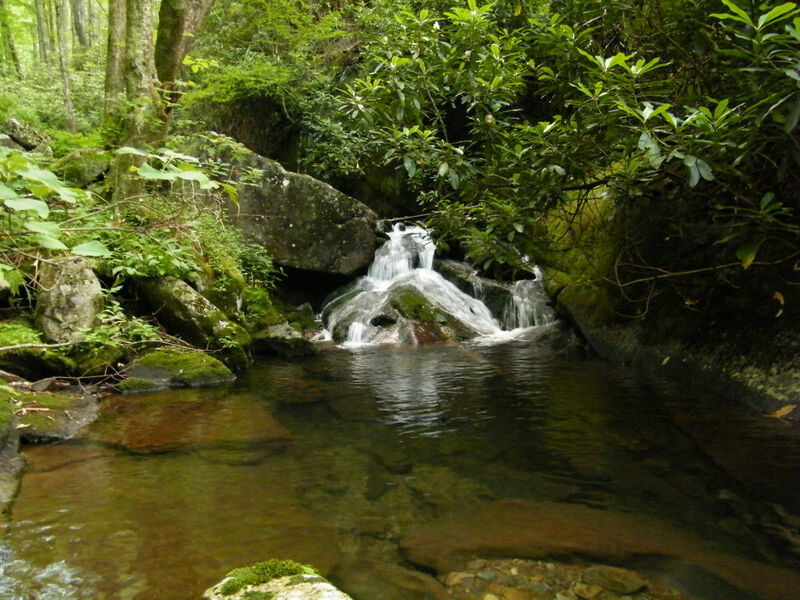 From the eastern edge of Lakeview Drive near Bryson City, NC, expect a moderate to difficult 13.6-mile trek alongside and across Forney Creek with diverse terrain along the way. The area is a wet one, making for lush mountain laurel and mossy creek beds, perfect for the hiker who may also be a photographer (or likes to post about her adventures on Instagram). Keep an eye out for wild turkeys and maybe even a bear along the trail, and look for the Forney Creek Cascades and other waterfalls that might be hidden—both scenic and muddy depending on the amount of recent rainfall. The 12-mile hike begins at the Noland Creek Trailhead off Lakeview Dr. East and connects to Forney Ridge via the Springhouse Branch Trail. The Noland Creek Valley is home to towering hardwoods and stone remnants of early settlers, and the lower elevation has a wide trail that is ideal for horseback riding and trail running. Once you get up to Forney Ridge, however, expect a challenge. The trail is primarily known for its trek through Andrews Bald, the highest grassy area in the Smokies, just two miles shy of Clingmans Dome. The trail varies between rocky and smooth, best suited for hikers that have experience with rougher terrain. A favorite among trail runners and horseback riders because of its smooth path, the Noland Divide Trail is a slow and steady ridgeline climb to Clingmans Dome from the Deep Creek area near Bryson City. The well-maintained path is ideal for hikers who want a moderate ascent but without the technical aspects of other trails. Plan to spend a little extra time on this 14.5-mile trail to see the waterfalls along the way, as well as the Lonesome Pine Overlook for miles and miles of unobstructed views. 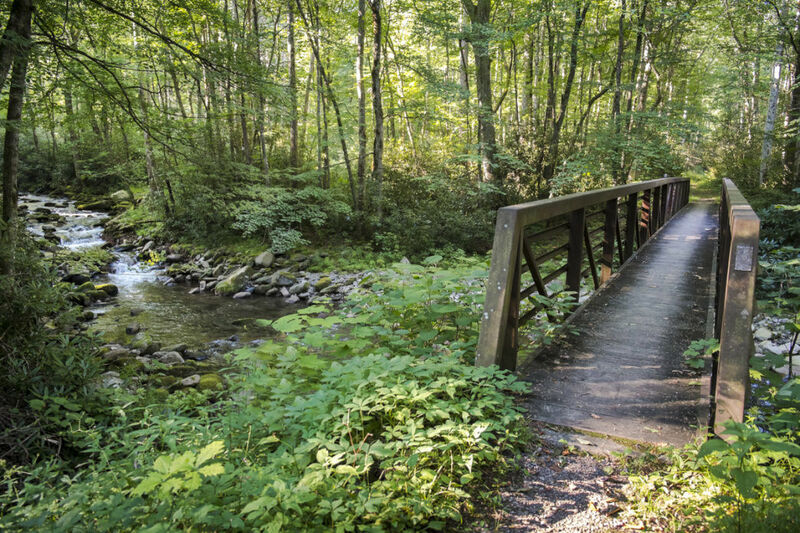 From the Elkmont Ranger Station, follow the Little River Trail to the Goshen Prong Trail for a 13-mile trek to Clingmans Dome. Lightly trafficked with lots of river crossings, the trail eventually meets up with the Appalachian Trail in what becomes a westward rocky ascent to the Clingman Dome Bypass Trail. Expect to see day hikers along the Little River section, particularly during spring and summer when Smoky Mountain wildflowers are in full bloom. The area was once run by logging companies, so you may notice the railroad remnants along the trail. Note that Elkmont is a popular camping area, so reservations are required if you want to turn your hike into an overnight. Starting at Fighting Creek Gap Road off US-441, this moderate-to-difficult trail leads hikers on a 14-mile stretch from just outside Gatlinburg across Sugarland Mountain. With a handful of scenic peaks and knobs, the Sugarland Mountain Trail scarcely crosses two river branches, so be sure to bring enough drinking water. Expect steep gains and drops as the trail climbs up to over 5,000 feet in elevation to the Tennessee-North Carolina state line. This trail is ideal for the hiker who wants expansive views over impressive ridges and steep slopes. 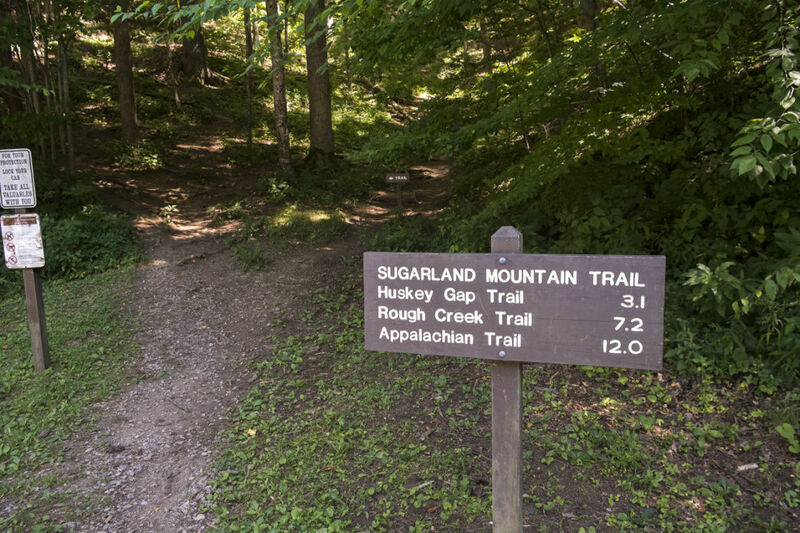 Sugarland Mountain Trail is closed indefinitely due to the wildfires in 2016. For the serious backpacker, the Appalachian Trail hike from Fontana Dam to Clingmans Dome earns a badge of honor. With seven shelters along the way and dozens of gaps, knobs, and spectacular overviews, this 30-mile one-way hike across Thunderhead Mountain is a must for those who have the entire AT on his or her bucket list. While the AT is free for all who want to hike it, be sure to contact the Backcountry Information Office at (865) 436-1297 the most up-to-date information any permits or reservations you may need.